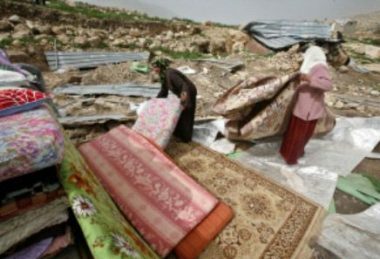 Several Israeli army vehicles, and bulldozers, invaded earlier Tuesday the village of Khirbit Tana, east of the northern West Bank city of Nablus, and demolished several residential sheds and structures. Ghassan Daghlas, a Palestinian Authority official in charge of Israeli settlements’ file in the northern part of the West Bank, said the soldiers surrounded the entire community before invading it. Daghlas added that the soldiers then proceeded to demolish many residential sheds and structures, owned by Bedouin families, after forcing them out. The official also stated that the village has been subject to frequent invasions and destruction, including the demolition of its only school, in addition to many residential sheds, structures and barns.